About us is about me, your host, webmaster, former Vancouverite and humble servant. So who am I? I am Mike Corbin, a new resident of Nanaimo, a harbour city on Vancouver Island. I am a ferryworker with BC Ferries and I work out of Departure Bay ferry terminal in Nanaimo. Currently I work onboard one of the ferries that sails daily out of Nanaimo to Horseshoe Bay. Horseshoe Bay ferry terminal is one of two major BC Ferry terminals located within the Metro Vancouver area. 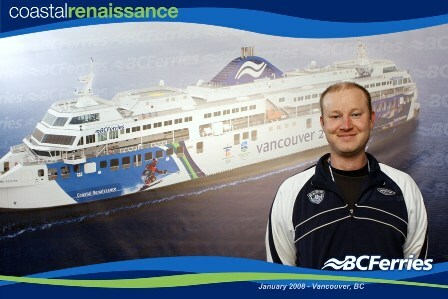 Here is me standing in front of a picture of BC Ferries newest ship the MV Coastal Renaissance. I'm wearing a jacket with the logo of the Vancouver Whitecaps on the upper right hand side. I love socer so I support the Vancouver Whitecaps. I also love Manchester United and my favorite United player is Ryan Giggs. If you are from the UK I bet you thought I would say Cristiano Ronaldo! Although I do like Cristiano Ronaldo, Ryan Giggs plays with heart and soul and I like that in a player. I wish the Vancouver Canucks had a player like him who can still deliver the necessary results! This site is built with Site Build It! I think I am the third owner of this site. I am a cat lover! I have two cats, but no kids. But I do have a neice and nephew. They both live in Kamloops. Incidently I was born in Kamloops in 1971. I lived there twice and my sister lives there now with her husband. My parents are living in Kelowna which is where I graduated from highschool and where I attended my first two years of cooking school at Okanagan College. I finished up my apprenticeship at Vancouver Community College. Although I've lost interest in cooking professionaly at one time I worked at the Salmon House in the Hill restaurant in West Vancouver and part time at the Beachside Cafe, also in West Vancouver. Prior to those two jobs I also worked at the Coast Royal Anne Hotel, and The Grand Hotel Resort and Conference Center both of which are in Kelowna. So there you go, a little bit about us and about me. Stay in touch and drop me a note , I'd love to hear from you.